Anytime I try a new taco stand, I always try the Tacos al Pastor. To me, they are a good indicator of the overall quality of the tacos there. There are some restaurants in Mexico which are dedicated entirely to this style of taco and in Mexico City it is practically an institution. However, nearly every time I order one of these someone asks me what a Pastor taco is and why it is called that instead of “pork taco”. Let’s dive right in and learn more. First of all, “al Pastor” means “sheperd style” and many sources cite that its origins come from Lebanese immigrants who arrived in Mexico during the 1960’s and with them came the Shawarma. 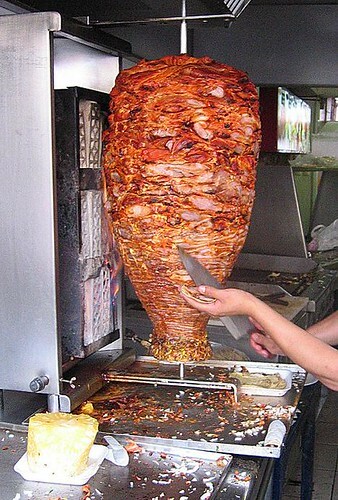 Today, tacos al pastor are made from pork shaved from a spit much like a Shawarma sandwich, a Gyro or a Doner Kebap. After marinating the meat, it is cooked on a rotisserie with a pineapple on top. The pineapple provides a very sweet flavor which can be nice alongside some strong cilantro or salsa. The marinades are the real unknown factor as you go from stand to stand. Different regions in Mexico have different recipes for their pastor marinades and these recipes also vary at each restaurant or stand. These recipe secrets are highly guarded and they also make each taco pastor unique and a reason to come back to that establishment. These tacos are also often called “tacos de trompo” named after the trompo which is the cylinder that the meat rotates on while slicing it off. Also, when you see a gringa offered on a menu, this is similar to a pastor, but instead it is served on a wheat tortilla with cheese. I ordered a gringa once in Puebla on accident and it was one of the greatest things I have ever tasted. So there we have just one example of a mezcla of different cultures (Middle East meets Mexico) which results in a very delicious treat. We’ll come back and talk more about tacos al pastor and I will let you in on a little secret : where to mind my absolute favorite tacos al pastor in Salt Lake City. Stay Tuned. Taco enthousiast Ethan shows how to properly care for tacos al pastor while dining at the yet-to-be-disclosed establishment which makes the best pastor in town. 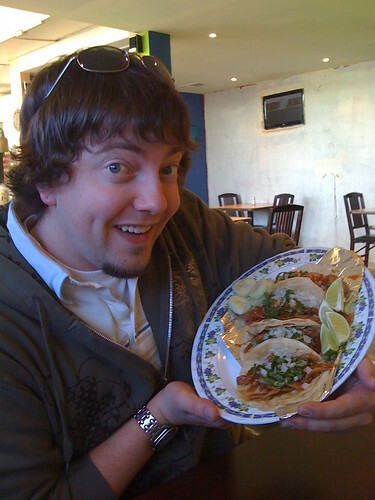 This entry was posted in Uncategorized and tagged middle_east, pastor, pork, tacos. Bookmark the permalink. What??? Yet to be disclosed? You’re killing me! Awesome blog. I love the tacos downtown and can’t wait to learn about the ones I’ve missed that I need to know about. Cardy said tacos al pastor are taco prepared by the pastor of a church. Cardy is partially correct. Although they are “sheperd” style technically, those of us who have tried them know very well that they are best when prepared by a pastor. Some of the best pastor marinade recipes are locked in vaults in the Vatican which some pastors have been lucky enough to access. Those are my favorite style of meat…. Stay Tuned? That’s mean….. Where??? No more chit chat…I need locations and stars. I’m always in the mood for some smothered enchiladas and need a new place to try out. Aye, por fin tenemos nuestro primer comentario en espanol. Bienvenidos, everardo! Estoy de acuerdo que el “al pastor” es lo major taco y tambien que los mejores se hacen en el D.F. Hay cocineros aca en SLC que hacen tacos iguales y son chilangos muy amables del D.F. Welcome, and I hope you join in for more taco discussion! Estoy de acuerdo, everardo. 100%. Ese restaurante que le gusta tambien es mi favorito en este momento por los tacos al pastor. Y conozco al dueno del restaurante y el me dice que el restaurante en provo se va a abrir pronto. Quizas este fin de semana. Vamos hacer una revista de este restaurante esta semana. 5 estrellas. Sin duda! Hay una sucursal de los Chungas en provo! esta muy bien! me recuerdan el autentico sabor a los tacos de Mexico… muy buen lugar para comer antojitos mexicanos! Los Chungas en Provo tiene un excelente servicio. Seria muy bueno dar a conocer mas el restaurante. Si el restaurante ofrece 10% descuento a estudiantes muchos estudiantes irian. Pues la mayoria de la poblacion en provo son estudiantes. Paquetes familiares o de estudiantes o tambien hacer comida en eventos especiales seria una bueno oportunidad de dar a conocer el restaurante. I just heard about Chungas in Provo from a friend and was so excited to find a new Mexican resteraunt! It’s the most authentic and tasty mexican I’ve had, and I want to tell all my friends because I’m so excited about their food. I just found this restaurant this weekend and it is the best Mexican food I have eaten since living in Mexico four years ago! Their tacos al pastor are incredible and the fried bananas are delicious. You have to go and try the food! This place is great! I have enjoyed the food every time I have gone to Al Pastor and I’ve tried many different things so far. We’re telling all of our friends to come here. I really enjoy eating at Al Pastor in Provo. It’s really affordable and you get a really good meal! I’m glad that our friends recommended it to us, cause now we can recommend it to all our friends and family! where is al pastor at in provo?